World Security makes home automation easier than ever with intelligent automation of your lights, locks, window treatments, thermostats, garage doors and even small appliances. Our Home Automation services are fully integrated, giving you a complete, feature-rich solution. World Security’s intelligent, interactive security solution thinks for itself. With robust automation rules, like Smart Schedules™ Activity Patterns, you can create customized schedules and easily develop highly personalized rules to manage your lights and thermostats. World Security’s Home Automation can also create rules so that with just one touch, the security system is armed, lights turn off, the front door locks, the garage door closes and the temperature in the home cools down to a desired ideal. 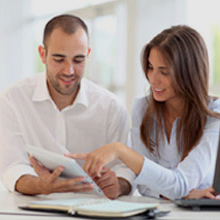 Whether you’re single, a working couple, or raising a family, World Security has a great solution for you. Our automation brings you always one touch away from your home and family, making your house the smartest one on the block. World Security’s powerful interactive security platform gives you unprecedented control over your property. With easy-to-use apps and web interfaces, you can arm your system, monitor sensor activity, watch live video, and control lights and thermostats — all from a smartphone or web-enabled mobile device. Click here to find out more. World Security is simply more reliable and more secure than a typical alarm system. 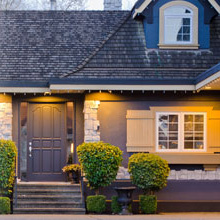 With a dedicated cellular connection, your home is protected even if the phone line is cut or the Internet is interrupted, and for 24+ hours after a power failure. We’ve also developed exclusive, patented technology that provides a superior level of protection and awareness. Click here to find out more . With the price of natural gas and electricity today, heating and cooling your home becomes more expensive every day. With World Security’s energy management you enter a Xone of comfort and savings by having control of your thermostat and lights at your fingertips. Click here to find out more. World Security makes managing the energy use in your home simple. With Smart Schedules, mobile apps and World Security’s energy automation system that learns, adapts and optimizes, you will always be in control of your thermostats and your energy management. With World Security, you can set up powerful, customized rules to automatically control your locks, lights and thermostats based on your personalized settings. World Security’s Geo-Services powered by Alarm.com empower your home to automatically adjust settings based on your location, providing you with even greater convenience. World Security’s Smart Schedules™ powered by Alarm.com let you set up customized schedules and personalized rules to manage your lights and thermostats. 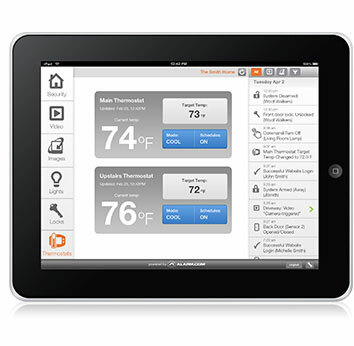 Intelligent design and simple to use mobile apps make it easy to set up and stop wasting energy. 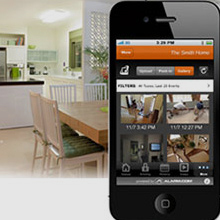 Mobile apps from World Security and Alarm.com help you get more from your security system. Now it’s simple to be in control, get alerts, manage your energy and watch video in the palm of your hand.